Gaucher disease is a rare genetic disorder that is one of a group called lysosomal storage disorders. It is an inherited disorder that results in the accumulation of a fatty substance called glucocerebroside in the body’s organs and tissues. 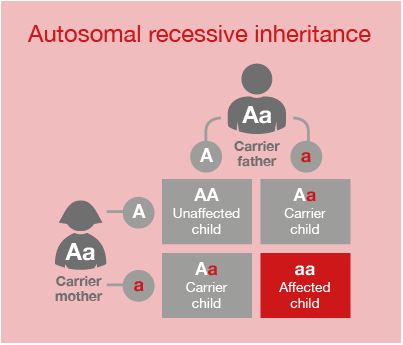 It is caused by a missing or deficient enzyme called ‘glucocerebrosidase’.1 In people with Gaucher disease, the gene that would normally tell the body to produce this enzyme is altered (often called a gene mutation). 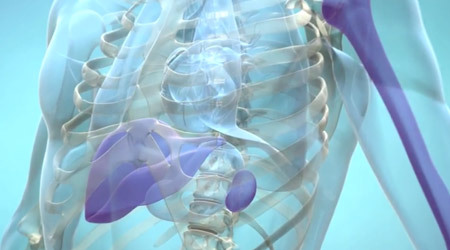 The main signs and symptoms are an enlarged liver and spleen, low platelet and haemoglobin counts, and problems with bones and joints. 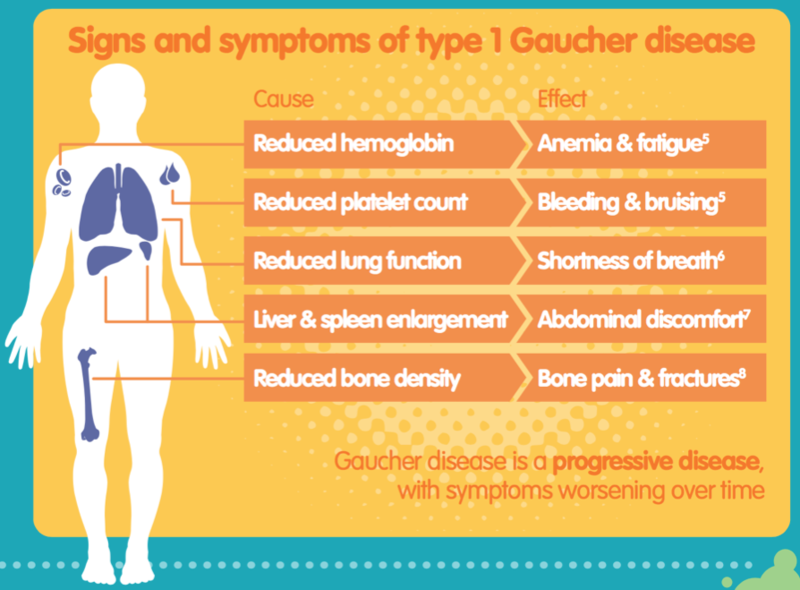 What are the signs & symptoms of Gaucher disease? Grabowski GA. Phenotype, diagnosis, and treatment of Gaucher’s disease. Lancet. 2008 Oct 4;372(9645):1263-71. Tantawy AAG, et al. Results from a 12-month open-label phase 1/2 study of velaglucerase alfa in children and adolescents with type 3 Gaucher disease. J Inborn Errors Metab Screen 2018;6:1–5. Zhang W-M, et al. Natl Med J China 2009;89:3397-3400. Brian (Carer): "When I met Elaine she was fit, full of life … and then when we got to know each other she eventually turned around to me and said, amongst other things ‘Oh, by the way, I’ve got Gaucher disease’. It was like ‘What? 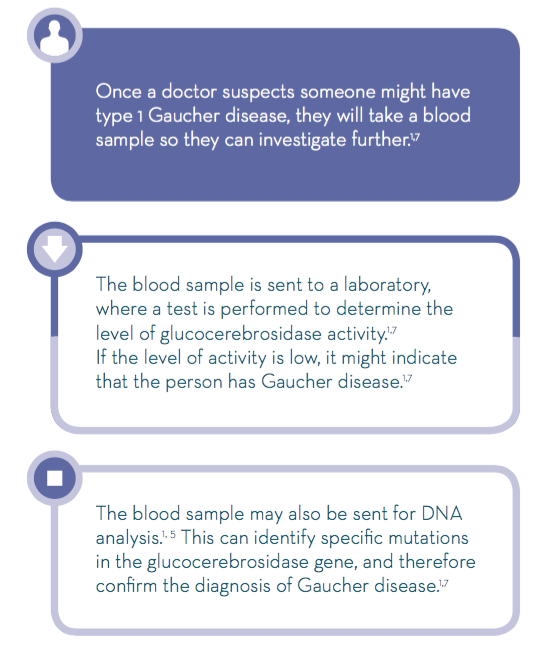 Wait, what is Gaucher disease?." Virginia (Patient): "My first Gaucher symptoms were an enlarged liver and spleen, low platelet levels and a slow growth and development." Elaine (Patient): "By the age of about 4 or 5, I was showing the classic signs of Gaucher disease: a very pronounced tummy, very pale skin, my limbs were very thin and I would bruise very easily." Ivana (Patient): "Doctors from my city hospital, they did not know what was happening. They hadn’t even heard of Gaucher disease." 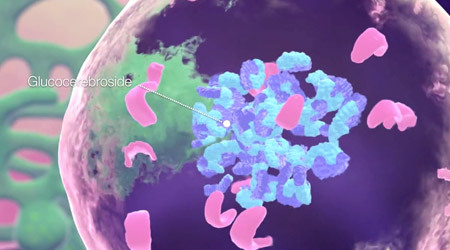 Watch a brief video about the causes of Gaucher disease. 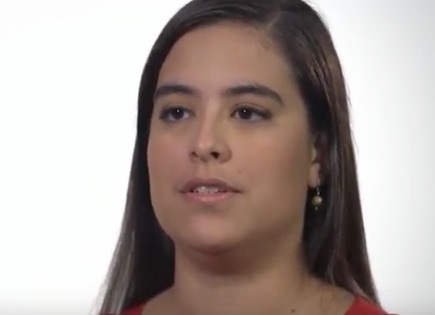 In this video Gaucher disease patients discuss how they were diagnosed. 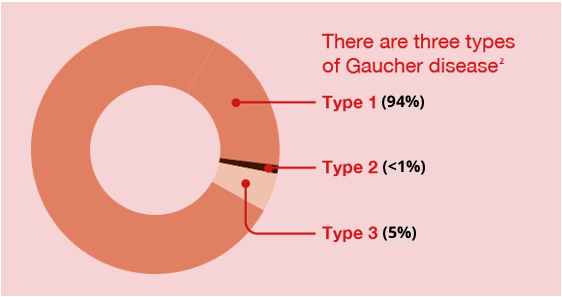 Download the Gaucher disease brochure for helpful information.